"We hate to see these disasters occur. And what we quickly transition to is, how can we prepare better in the future?" conservation engineer says. In the wake of this week's historic flood in Brantford, Ont., and along the Grand River, scientists will be studying the ice jam with hopes of guarding against similar catastrophes in the future. "We hate to see these disasters occur," said Dwight Boyd, director of engineering for the Grand River Conservation Authority. "And what we quickly transition to is, how can we prepare better in the future? "What can we learn from these events so that we can have improved resiliency going forward?" Boyd and other authority staff plan to visit with a team from the Ministry of Natural Resources to review drone footage and photographs. A component of their study will be training younger staff who haven't seen one of these floods before. 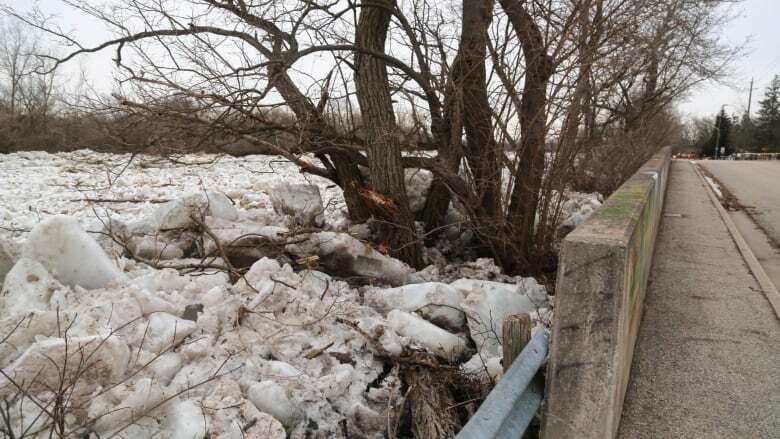 By late Thursday afternoon, the authority said the ice jam in Brantford had released. Water levels at the Brantford gauge station were at 4.2 metres, down from 7 metres on Wednesday. The authority warned the breakup could send a heavy flow of ice and debris down the river. Well downstream, the Canadian Coast Guard icebreaker Griffon is part of the campaign to combat the flooding. It was working at the mouth of the river at Lake Erie on Wednesday, clearing ice to make sure there are no ice jams there and floodwaters have free passage into the lake. Boyd has worked at the authority since 1985. "I've seen a lot of things," he said. "And certainly, every flood, you learn something and we're learning from this flood." The last time there was an ice jam this big in the Grand River was 1996, Boyd said. Boyd said after the 1996 ice jam flood, the authority removed an old remnant dike that was near Birkett Lane in Brantford. That's the kind of mitigation possibility they will be looking for going forward. A confluence of factors led to the current disaster. Extreme cold in December and January built up strong, deep, clear blue ice in the river – nearly a metre thick in places. Then, there's a flat place in the river south of Brantford that was once a glacial lakebed. Water tends to pond there and back up, and this year, the extreme cold created a strong ice sheet through that Oxbow section. When temperatures warmed in January, ice upstream broke up, flowed downstream and met the strong ice in the Oxbow, causing an "ice jam." Then the temperatures dropped again, and froze that jam in place. All of that was similar to what had happened in 1996, Boyd said. But then the February melt came. "We have record rainfall for February, warm conditions for this time of year, and really what we had was a spring melt that would be very similar to what we would typically see in late March or April," Boyd said. That rainfall and snowmelt would have created a large flood in the river even without the ice jam. But then an ice jam upriver in Cambridge broke and sent a surge of ice and water toward Brantford early Wednesday morning. That collided with the ice jam already in Brantford, and built up the ice jam to the point of overtopping the dikes. That's a height of as much as 8 metres, Boyd said. Boyd said there wasn't any risk of a similar ice jam pileup happening downstream of Brantford. On top of the modeling and predictions Boyd and his colleagues are doing, they also must try to navigate the unpredictability of climate change. 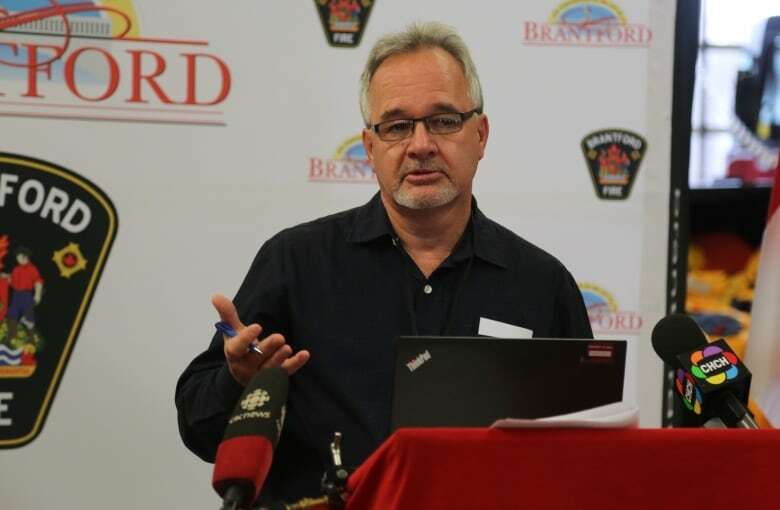 Wilfrid Laurier University professor Bryce Gunson said the flood in Brantford "speaks to the larger issues around extreme weather that we've heard the last number of years." The rate of change – the pace with which one day might be –5 C and the next day 14 C – is becoming more rapid, Gunson said. "We're used to having cold winters, and gradual warm-ups in spring, and it's been fairly predictable over the past 50-100 years," he said. "With these sudden changes it puts a lot of pressure on natural systems, and of course, those affect our built infrastructure." Kelly Bennett is an award-winning reporter who lives in Hamilton. She grew up in Victoria and covered economics and arts as an investigative reporter in San Diego. She loves digging into great stories, hiking and playing the violin. Drop her a line anytime at kelly.bennett@cbc.ca.